FOR ALL YOUR SEWING AND EMBROIDERY NEEDS! I restore vintage linens and recycle nearly destroyed linens into new items such as heirloom baby gowns or children's clothing. Sewing lessons are offered for ages 8 and up. Lessons include basic sewing skills right on up to heirloom sewing. Check the Class Agenda for more information and the next available start dates. 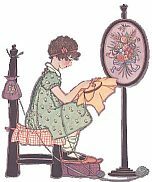 If you are looking for someone to do your sewing mending or alterations or perhaps you wish to learn to make your children some beautiful clothing of your own then just give me a call and I would be more than happy to help you! This page was last updated on 09/21/01.